The restaurant is run by the family, which includes Sig. Rolando and his wife Rita, their children Patrizia and Riccardo, their son-in-law Claudio, their daughter-in-law Sabina and their granddaughter Paola. 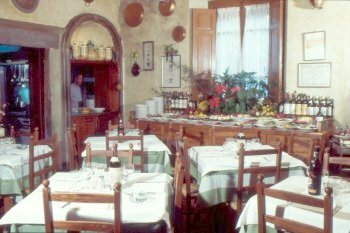 The building which has housed the restaurant for more than 50 years and the wine shop before that has a long history, dating back to the early years of the fifteenth century, when it was a monastery. 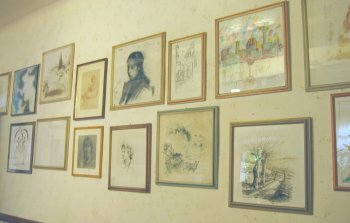 On the interior of the Trattoria, in fact, one can admire frescoes and various other historic remains. In time, the structure became a tavern and wine shop. Beneath an arbor where a beautiful well was located, people would gather to restore their spirits with food and drink and to rest their horses before undertaking the climb to Settignano. The neighborhood has been home to some world-renown figures over the years, including Michelangelo, Gabriele d’Annunzio, Eleonora Duse, Mark Twain, etc.